LP VERSION ON TRANSPARENT RED VINYL - STUNNING COVER ART! The Ding Dong Devils create a wild hybrid musical cocktail by taking a base of Tiki, exotica and Polynesian pop, then mixing it with dashes of fuzzy 60’s garage rock, amped-up rockabilly, tremolo-laden surf, and even the greasy bump and grind music that was used to accompany burlesque performers. As a festive garnish, they add eccentric stereo arrangements of 50s and 60s hi-fi records, featuring instruments such as steel and baritone guitar, xylophone and ukelele. 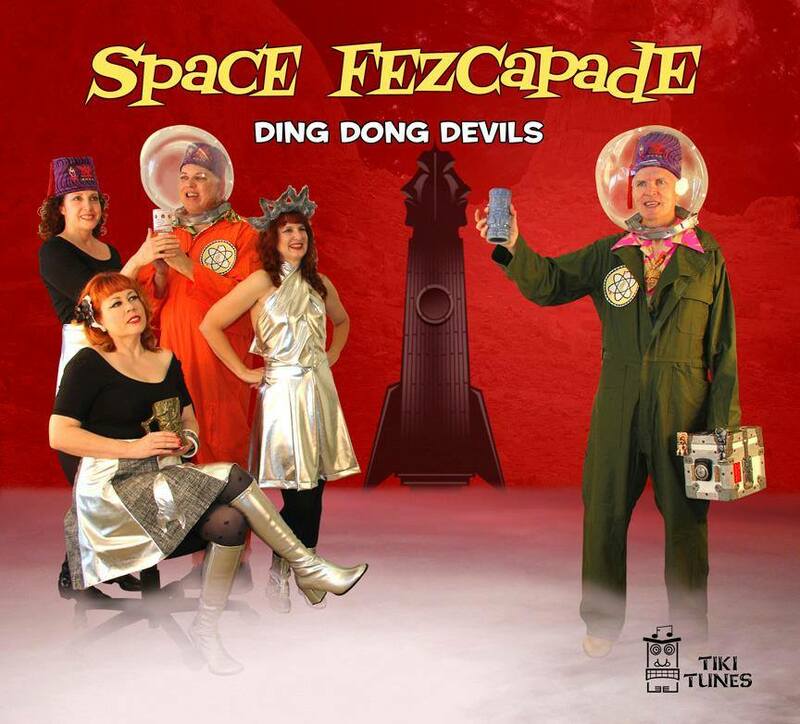 The fez-wearing band counts Link Wray, Martin Denny, the Cramps, the Sonics, Elvis, the B-52s, Sol Hoopii, Esquivel, Joe Meek, Jerry Lee Lewis, Don Knotts soundtrack composer Vic Mizzy, and the Las Vegas Grind and Frolic Diner LPs among their inspirations. Their original repertoire, written and sung variously by all four members—two female, two male—is split between instrumentals and vocals. The vocal numbers (laden with tongue-in-cheek humor and satire) often tell stories set within the worlds of Tiki culture, Polynesian Pop and dark jungle adventure, but with very strange twists and turns along the way. The Los Angeles-based band consists of Brent Walker (Caltiki) on guitar, steel guitar and mandolin; Julia Devine (Nepheria) on electric and upright bass; Rosann Simeroth (Puka von Pele) on drums and percussion; Edwin Letcher (Rama Lama) on guitar, ukulele and xylophone, and all four on vocals. Some other bands the members have played in include Del Noah and the Mt. Ararat Finks, Moist and Meaty, King Dapper Combo, the Omlits, the Pivot Foots, Cheeseburger, the Hillbilly Varmints, the Henpeckers, the Fleagles, the Controllers, Lovingkindness, the Thirsty Brats, Bangers & Mash, and the Rotters. 3. Theme From "Mohawk Over the Moon"
8. Can You Dance to It On Mars?